The holidays are here! Tomorrow morning Chris and I will be waking up bright and early to catch a 7:50 a.m. flight to Houston. We’ll be visiting his family in Texas for Thanksgiving. While I hate early morning flights, I think I hate airport food even more. Unlike most people, I get to see what my blood sugar does (real time now with my Dexcom!) when I eat a scone or even worse, a fast food breakfast sandwich. Not good people, not good! So I’ll bring a little snack of my own, homemade Lara bars. If you’ve never had a Lara bar, you are missing out. They are made with only a handful of ingredients, all real foods like dates, dried fruit, nuts and spices. So basic, in fact, that you can make your own and save about $4 a bar! 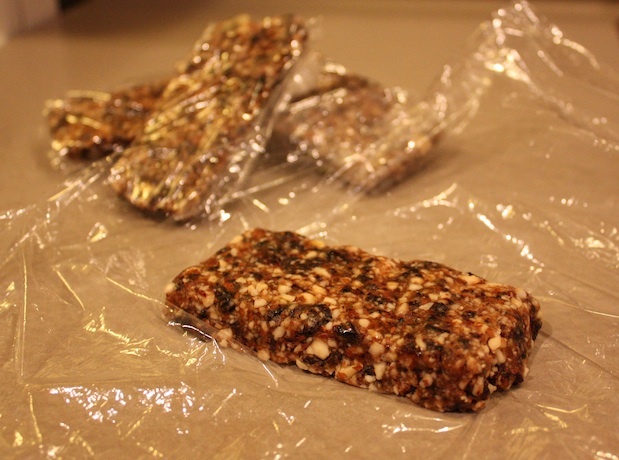 I followed this recipe from Enlightened Cooking to make some Very Cherry Bars. “LARA BARS use a multi-layer package that keeps out UV light and oxygen, which, in turn, maintains freshness without the use of preservatives. I use plain old plastic wrap and my refrigerator, then pop one in my bag when I’m ready to go.” – Cooking Hussy Note: Yep, this worked well for me too! Place the dates (minus seeds!) and cherries in a food processor. Pulse until processed to a paste. Transfer paste to a medium bowl (don’t clean processor). Or, if your cherries are a bit too dried, transfer to a big chopping block and chop away. Add the nuts to the processor and pulse until finely chopped. Add the nuts, along with the cinnamon, to the bowl with the fruit paste. Use your fingers to knead the nuts into the paste (just keep squishing, it’s fun). Divide mixture in half, then in half again (4 balls). Place each piece on a sheet of plastic wrap. Wrap the plastic around each bar and start squishing into a bar shape form, 3 and 1/2 inches long, 1 inch wide and 3/4-inch thick); press against countertop to flatten bottom side, flattening top side and ends with flat of hand. Tightly wrap the plastic around each bar and store in the refrigerator. Makes 4 bars. Notes: I look forward to trying some varieties with walnuts and dried apricots as well! I made the Cherry and Almond variety this morning. Delicious! I think I have found my substitute for Fiber One Bars for breakfast when I am short on time. I can see myself making these most weekends to have a stash for the week. Mine, however, did not look as lovely as your picture! I may have processed the cherries and dates too long, as there were no fruit chunks in my past. Mine just look like dark brown paste with little almond pieces in them. Thankfully, I am not much concerned about their appearance, just how they taste! I look forward to trying more of the many variations on the Enlightened Cooking website. Thanks for the link! Have you tried the walnut and apricot flavor yet? Actually, the dried cherries I used were a bit TOO dried out, so hard that the food processor just tossed them around a bit. So I had to take them out and hand chop them with my chef’s knife. So, I think you did it the correct way! I’m so glad you enjoy them. Check out the original link to find some variations too!